Dimensions vary based on size and arm style selected. Design your own sofa, sectional or chair by specifying a frame size; arm, base, cushion and back styles; and one of many fabrics. Then Bassett will custom-create the seat for you and have it ready for delivery in just a little over weeks. The style shown here is medium scale. 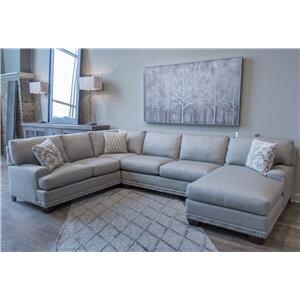 The HGTV Home Design Studio Customizable U-Shaped Sectional with Chaise by Bassett at Great American Home Store in the Memphis, TN, Southaven, MS area. Product availability may vary. Contact us for the most current availability on this product. The HGTV HOME Custom Upholstery program by Bassett is the ultimate in personalizing your furniture, enabling you be as creative as you want to be. Choose from every conceivable seating option and the size that best fits your room. Then, customize each item by choosing from 6 different arm styles, 5 base or foot options, 3 back styles, and over 750 fabrics for the cover and the pillows. Finally, add your finishing touch by choosing cushion comfort, contrasting welt, nailhead trim, and wood finishes. Each item is then custom-built to your specifications and delivered in just a little over 4 weeks, compared to 8 weeks or more for similar programs by other manufacturers. Each item is built in the USA with premium components to the exacting standards of Bassett, so you will be sure that your furniture will be built to last. The HGTV Home Design Studio collection is a great option if you are looking for furniture in the Memphis, TN, Southaven, MS area. Browse other items in the HGTV Home Design Studio collection from Great American Home Store in the Memphis, TN, Southaven, MS area.